Everest Helicopter Tour: Let you touch Everest without a trek! Everest Helicopter Tour Getting to Everest is on the bucket list of every single traveler, however not all dreams come to true. 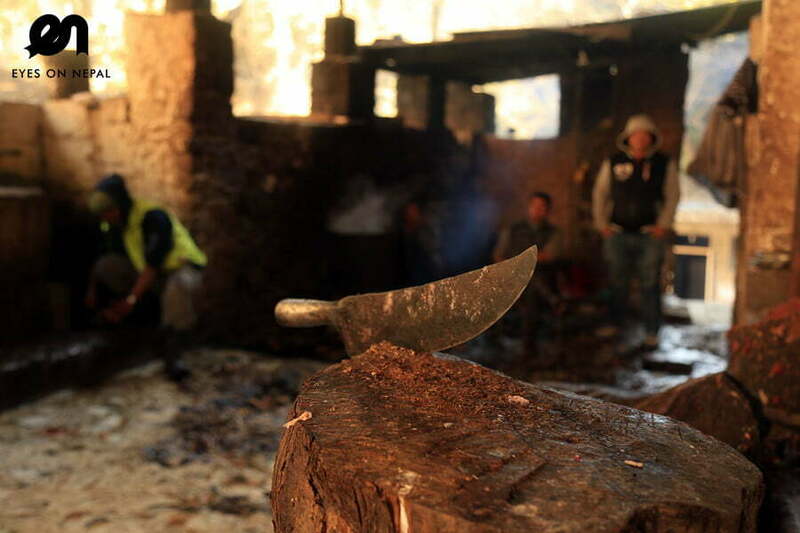 Some travelers may not be able to trek or have required physical stamina to hike to Everest. In order to provide these travelers equal opportunity to go and see Everest as everyone, Everest Helicopter Tour is being operated. 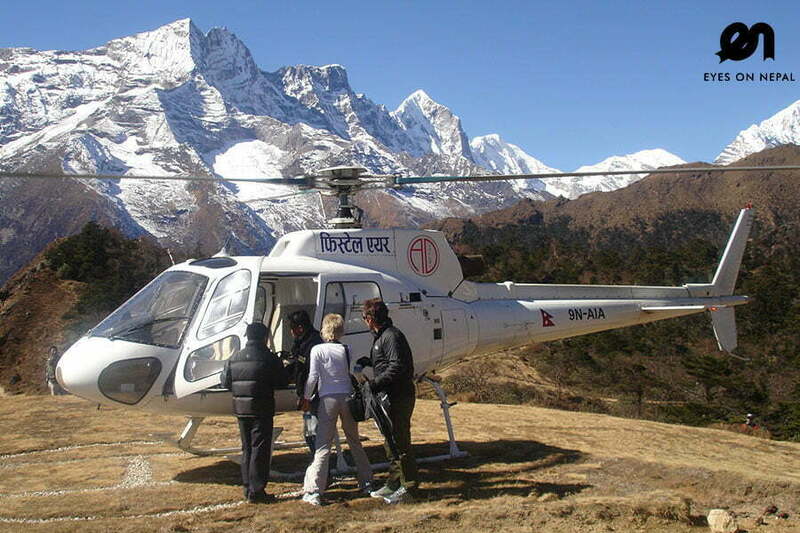 Everest Helicopter Tour allows everyone, even those without physical fitness, to view Mt. Everest, world’s highest mountain without having to trek. The journey begins from Kathmandu towards Everest Region as you fly over the towns of Lukla, Namche, Tyangboche, Gokyo and finally land at Kalapathar at 5550 elevation. From Kalapathar, one can watch Mt. Everest up close and personal. You will fly back to Syangboche for a breakfast at Everest View Hotel, the highest mountain in the world before heading back to Kathmandu. Mount Everest Helicopter Tour cost price at USD 1200 per person. Day 1: Your hotel - Kathmandu Airport - Lukla - Periche - Kalapathar - Everest View Hotel - Kathmandu ! Highlights: Mount Everest Helicopter Tour cost at only USD 1200 per person with 3 landing spots at Lukla, Kalapathar or Periche and Everest View Hotel for breakfast with Everest! 05.30am: Pick up from your hotel and transfer to airport. 06.30am: Arrive at Kathmandu airport, check in at the helicopter counter. 06.30am: fly to Lukla. You will see Ganesh Himal, Langtang, Shisha Pangma, Dorje Lakpa, and Gauri Shankar etc… in distant horizon. 07.30am: Arrive in Lukla airport for offloading the fuel. 08.10am: Continue the fly to Kalapathar. 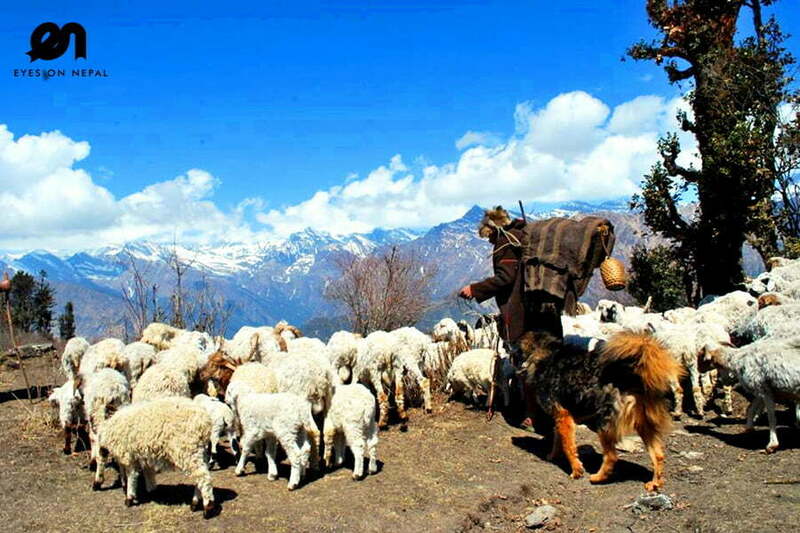 On the way, you will see Namche village, Tengboche, Syangboche, Periche and finally stop at Kalapatthar. (Note: If flight person is more than 3 then need to one more stop at Periche. You will feel colder here because of late sunrise due to tall peak and moutains blocking sun.) We will be spending around 10 minutes owing to high altitude and the need to keep the engine running (*Depends upon temperature). Besides it will be difficult to acclimatize in high altitude for longer period of time. Famous mountains such as Thamserku, Ama Dablam, Pumori, Lhotse, Everest and many more can be easily seen along this route. 08.30am: Continue the fly to Everest View Hotel near Namche. 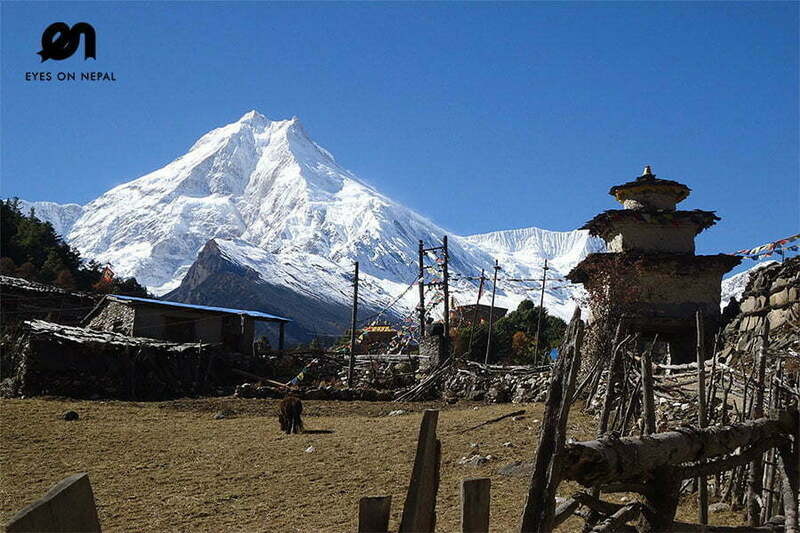 On the way you will see the Everest Base Camp, Lobuche and other Sherpa villages. 08.45am: Land in the hill of Everest View hotel. 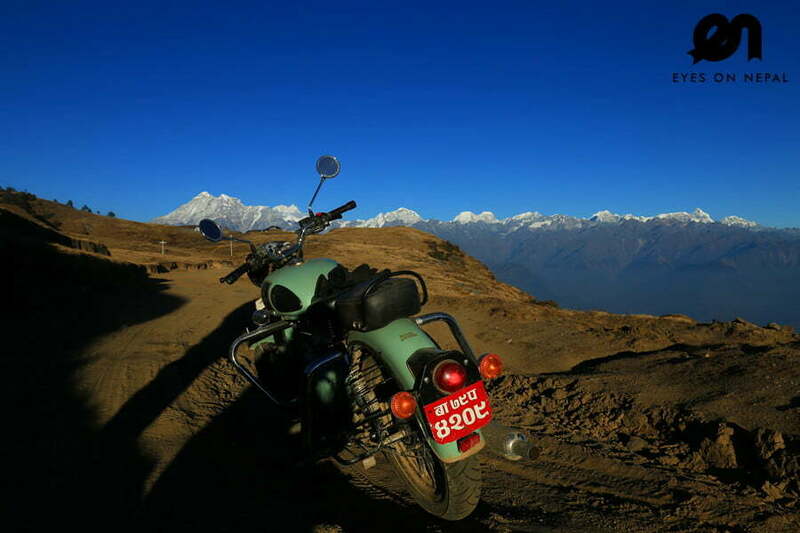 Here you will have 1 hour time to have breakfast as well as take in the majestic views of the Himalayas. Note: Opened in 1971 and inscribed in Guinness World Records, Everest View Hotel is the highest altitude hotel in the world offering luxury facilities such as oxygen cylinders. The hotel is a vantage point to get a glimpse of 180 degree Celsius view of the Everest range of himalayas. 09.45am: Take off from Everest View Hotel to Lukla where we will stop for refueling before continuing our journey towards Kathmandu. On the way you will see Pikey Peak, Phaplu airport, Jiri Bazar, Charikot Bazar, Dolalghat, Banepa, Dhulikhel and Bhaktapur. 10.45am: Arrive in Kathmandu airport. 11.30am: Arrive at your hotel. Tour ends. Price Charged from at USD 1200 per person/ USD 6000.00 per helicopter, minimum 5 persons to go per helicopter. For inquiry and booking, write to sales@eyesonnepal.com. NOTE: If weight of each passenger lesser than 70kg each, then per helicopter can sit up to 6 person. Means, per person price will be USD 1000. TOTAL Maximum weight for all passenger should not more than 420kg. All land transportation and helicopter tickets. Helicopter charter charge from Kathmandu to Everest and back to Kathmandu.